1905 – the West Bridgford Urban District Council is debating whether to take up Andrew Carnegie’s offer of £3,000 towards a free library building in West Bridgford. After 1889 Carnegie’s offer was to build and equip new libraries on condition that the local authority matched this offer by providing the land and a budget for operations and maintenance of the library. In this situation the WBUDC proceeded democratically by organising a vote in the community to gauge whether it was in favour of paying an increased penny rate for the maintenance of a library. The majority of voters voted against having a library. 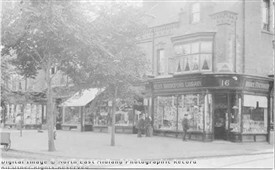 1910 – a photograph shows a shop on Musters Road with books displayed in the windows having a shop-sign that reads ‘West Bridgford Library’. 1935 – March, a Reading Room in Bridgford Hall is opened to the public and “appreciated”. Bridgford Hall had been dedicated to the public since 1923. – Temporary Library Service in West Bridgford - in October, accepting that the library rate had to be paid, the WBUDC forms a Library Committee and requests the Council to open a temporary library, “and so they got something for the expense which had reached £1,200.” It took some time to come to terms with the prospect of having to pay a library rate. Even as the temporary library service became an instant success, with 48,000 issues in the first six months and over 3,000 borrowers (in a community of approx. 21,000), a part of the community considered the temporary library rate to be the “thin end of the wedge” and foresaw that soon the maintenance of a permanent library would exact an even higher rate. 1936 – from January the temporary library opened by Nottinghamshire County Council was located in the Reading Room at Bridgford Hall. Meanwhile the contretemps between the County Council and the WBUDC continued into the planning phase of a permanent library for West Bridgford. After refusing initially to sell land for a library to the County Council, the WBUDC recognised eventually that the community would benefit most from a library situated in what was then the children’s corner of Bridgford Park and persuaded the County Council to withdraw from negotiations it had by then nearly completed for an alternative site (the garden of West Bridgford Rectory). 1938 – building work commences for a new library on the site of the children’s corner of Bridgford Park. The County Council accepted in 1937 the tender of Messrs. R. Hofton and Son, Ltd., of Beeston, amounting to £6,183. Meanwhile the Temporary Library was sustaining demand by issuing 96,718 volumes in 1938-39. 1939, Friday 3rd March – opening of the new West Bridgford Library by Major T.P. Barber, chairman of Nottinghamshire County Council. The building contained a lending library, children’s library, study room and a reading room. The cost of the library building amounted to approx. £6,200 and the fittings £1,045. The shelf capacity of the library was about 7,000 volumes with a basement storage facility for another 6,000 volumes. During its first year the Library issued 236,434 volumes. An article in the Nottingham Guardian printed on the day mentions that the building was designed by the County Architect E.W. Roberts, and that traditional materials were used: the front façade has dressings and a centre feature of natural Clipsham stone, the main walls built in sandfaced bricks and the floors polished teak blocks laid on concrete. 1941 – a Citizen’s Advice Bureau and Information Centre is opened in West Bridgford Library’s reading room and believed to be the only one in the county staffed by members of the W.V.S. 1944 – 1949 local artists endow the Library with art works and turn part of the Library into gallery space for viewing paintings. In February 1945 the Library also hosted an exhibition of Royal Crown Derby china with accompanying lectures and workshops. In 1946 it showed Wedgwood china in April and needlework in November. 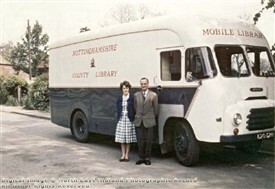 1949 – West Bridgford Library launches the first mobile library service in Nottinghamshire consisting of 2,500 books. The service targets rural areas in the West Bridgford region south of the Trent. 1964 – West Bridgford Library launches a loan-a-record scheme open to all, with a stock of 400 12-inch LPs including classical music, documentary and spoken word recordings – but no pop!! This flags up the need to modernise and extend the building to accommodate social change. 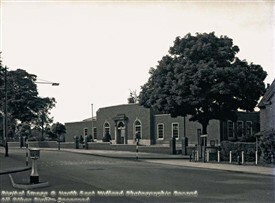 1969 – West Bridgford Library has an extension built in. The stock is increased, there is a reference room providing room for studying, an exhibition area and a junior library in a separate space on a floor above. The floor area of the extended library is double what it had been. 1999 – West Bridgford Library offers People’s Network computers to the public to use free of charge, enabling people to access the internet as well as a number of subscription databases and Windows software packages (from 9th December). 2008 – plans are proposed by Nottinghamshire County Council and Rushcliffe Borough Council for a new library as part of a community hub. This would be a one-stop-shop and bring together library, young people’s services, adult social care and health, benefits and advice bureau and registrars’ services under one roof. The estimated cost is £7m. 2009 – concerns are raised by English Heritage about the integration of the community hub design in the vicinity of Bridgford Hall. Altered plans for a new library were then submitted, which offered a two-storey building with meeting rooms and a council customer service centre. In response to English Heritage the new design made use of traditional materials for the building. Following local elections in May however, a change of administration at County Hall saw a reappraisal of the council’s capital programme and the plans were cancelled. 2010 – new plans for the library are drawn up retaining the original frontage, incorporating a Young People’s Centre, Shop Mobility and Registry Office. - Self Service kiosks are in use at West Bridgford Library from 26th April. 2011 – the plans are approved and work commences on the rebuilding of West Bridgford Library on its existing site. In the meantime, the service is run from temporary premises on Rectory Road. 2013 March – opening of the new West Bridgford Library and Young People’s Centre. Nottinghamshire County Council invested £5.3m in this capital project. This page was added by Betty Rose on 29/11/2012.